Since Fall 2011, I have been an Instructional Technology Fellow (ITF) with Macaulay Honors College, CUNY. From Fall 2011—Spring 2015, I worked as an ITF at Brooklyn College. As an ITF, I help professors integrate technology-based projects into their pedagogical goals and teach both these technologies and associated research skills to the students in full-class demonstrations, as well as in smaller group and one-on-one sessions. I have served as an ITF for 16 undergraduate honors seminars, as enumerated below by examples of seminars I have worked with. In Fall 2014, I became a Senior ITF, and I now mentor new ITFs and lead cross-campus digital projects. I develop digital curricula for new upper-level seminars and support curricula at all campuses by maintaining the Faculty website. 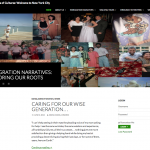 I manage the Seminar 2 Encyclopedia as each ITF works with their seminar’s students to build a public-facing digital project incorporating original research about immigration in New York City. For more on what an ITF is, check out this booklet group-authored by ITFs in Spring 2013. Seminar 1, the first seminar that Macaulay first-year students take, introduces students to the arts in New York City through readings and live performances and encourages them to develop new critical ways of discussing a wide array of arts. In Fall 2013, Jennifer Ball and I devised how to use the class website first as a space of critical reflection through a series of scaffolded arts reviews while simultaneously teaching them new methods of posting content on the website. In the second half of the course, the students split into editorial groups supervised by Ball, and I spearheaded brainstorming and facilitating technical and design needs with each of the groups so that they could design, produce, and edit their section of M Magazine, the resulting emagazine. For their spring semester, Macaulay first-year students take Seminar 2, a course where they investigate how different groups of people have shaped New York City through immigration, migration, etc. In Spring 2014, Jessica Siegel, both a Brooklyn College English Professor and journalist, encouraged the students to learn about different neighborhoods and their people through a series of assignments that required that they research and map their neighborhoods, interview its denizens, and construct a longer profile of a type of work. I taught the students about electronic research methods and how to use demographic and mapping tools and later advised groups responsible for organizing, designing, and presenting the assignments published to the class website. In Spring 2015, Paul Moses, both a Brooklyn College English Professor and journalist, led students to deeply analyze the Brooklyn neighborhood of Flatbush through a variety of methods including oral histories and archival research. Their website, The Peopling of Flatbush, featured original research from the precolonial through the contemporary era. I taught students methods for recording their oral histories, how navigate an array of digital resources and work with demographic databases, and worked with groups of students over a series of classes as they organized their research for presentation on the class website. In their final seminar, taken in the spring semester of their second-year, Macaulay students consider the future of New York City and how they might contribute to or shape that future, often learning about matters of public policy. In Louise Hainline‘s Seminar 4, students learned about the field of higher education in which they are enmeshed and about the current problems and potential future directions of education. More than just reading about these issues, students conducted numerous interviews with educators and administrators in a variety of public and private institutions across New York City, using this raw material to focus in on issues of purpose, access, economics, and technology in higher education. In addition to assisting students with the course website, I also played a role in teaching presentation skills as they developed presentation versions of their group projects for the final, cross-campus conference. To serve the Macaulay Honors College population at Brooklyn College, I spearheaded the creation of a Brooklyn ITFs website in Summer 2012 to collect together resources created by ITFs in their various seminars. 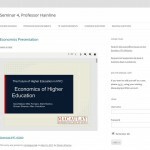 This website, along with other campus-based websites—like the Baruch ITFs website—and archives of past seminar sites—like the Seminar 2 Encyclopedia—showcase the various ways ITFs teach with technology and encourage the thoughtful and transformative use of a wide array of digital tools in the classroom.